Neo Tokyo is a three-part anthology of fantasy and science fiction anime short-films from the minds of Rintaro, Yoshiaki Kawajiri, and Katsuhiro Otomo. Neo Tokyo is what happens when you take three famous anime craftsmen and give them a budget and free reign to let their imaginations run wild. Neo Tokyo pulls three vastly unconnected stories together, and makes it all work as a fantastical whole. The first story-Labyrinth-is, by far, the most surreal of the three short films. Rintaro takes the helm of this story which revolves around a little girl named Satchie who's feverish imagination gets the better of her as she ventures through the looking glass, Alice in Wonderland style. Her reluctant and terrified cat, named Cicerone joins her on this wild ride against its will, and they both enter a world filled with strange creatures, surreal sights, and a circus that are visually reminiscent of the works of cartoonist Gerald Scarfe. The film has little to no dialogue, except for the beginning, and tells what scanty story the anime has purely through action. Despite some of the dark imagery that is laced through the visuals in this short, Satchie is never portrayed as a scared child, but as a curious observer and even Cicerone learns to enjoy the whimsical ride. Symbolically, the anime is about the power of imagination, as well as an allegory for the fear of the unknown, and the joy of discovery. All in all, it ends on a rapturous note. The second story of this triad of short films-The Running Man-does not end so pleasantly. Unlike the dark, yet whimsically upbeat imagery of Labyrinth, the world of The Running Man is centered around a cruel, nightmarish dystopia and focuses on a man named Zack Hugh. Zack is a champion racer who literally becomes one with his car as he, little by little, loses his humanity. The entire story is told through the eyes of a reporter who acts as nothing but an observer to his violent end. Visually, there is nothing in The Running Man that is original, the world feels like another Blade Runner incarnation with grime covered buildings glossed over by neon-billboards displaying cheap consumer goods. The story can be called a cautionary tale about mankind's incessant obsession with technology and how it dehumanizes us. This dehumanization leads to the literal death of Zack Hugh, and is exhibited in one of the most beautifully horrific ways imaginable. Oddly enough, this part of Neo Tokyo feels out of place when in comparison to the other two, for its violence. The final segment of Neo Tokyo-The Order to Stop Construction-is (subjectively speaking) the best one of the triad. In its own way, it is a light comedy that also acts as a parable for technology that goes out of control. Being that this part of the anime omnibus was put together by Katsuhiro Otomo, the theme of technology going haywire is a strong one. But unlike some of the other works by Otomo such as Akira, Steamboy, and Roujin Z, the theme of technology going bad is presented in a less threatening fashion in part of the main character, Sugioka. The character design of Sugioka is comical, and acts as a satire on the stereotypical Japanese salaryman; his hair is neatly-parted, he has a chipmunk overbite, and his glasses are as thick rimmed as can be. Sugioka is sent to a fictional South American nation to halt a construction that his company began, a while back, in the Amazon. He is the only human at the site, and the robot foreman in charge of construction has been programmed to finish the job. No matter what. This is where man and machine clash, and since Sugioka is viewed as a threat to the completion of the project, he is kept locked up in his office by the robot foreman. Visually, this is a stunning piece of work and is the most believable of the three stories. The robots of the construction site work endlessly through the grime and sludge of the harsh natural world, and end up falling apart because of it. The construction site is a sprawling network of machines that infringe upon the beauty of the natural habitat. Sugioka's cartoonish frustration at the machines apparent inability to heed his order for the construction to stop is amusing, and acts as a catalyst for most of the humor. 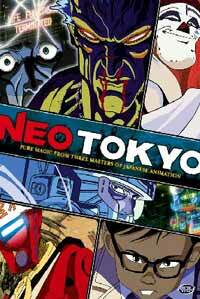 This was a short, but sweet, film and is one Otomo's best works. Conclusively, Neo Tokyo is not the most spectacular anthology of anime out there (compared to, say, Robot Carnival) but it does more than hold its own, and has enough intriguing ideas and fascinating imagery to warrant a viewing or two. In hindsight, it was well worth the $7.99 bargain bin price at the video store. Recommended Audience: Aside from the violent scenes in the running man, I do not understand why ADV films rated this DVD with a TV MA rating, though that segment is best viewed by adults. 'Labyrinth' and 'The Order to Stop Construction' can be safely viewed by younger viewers.